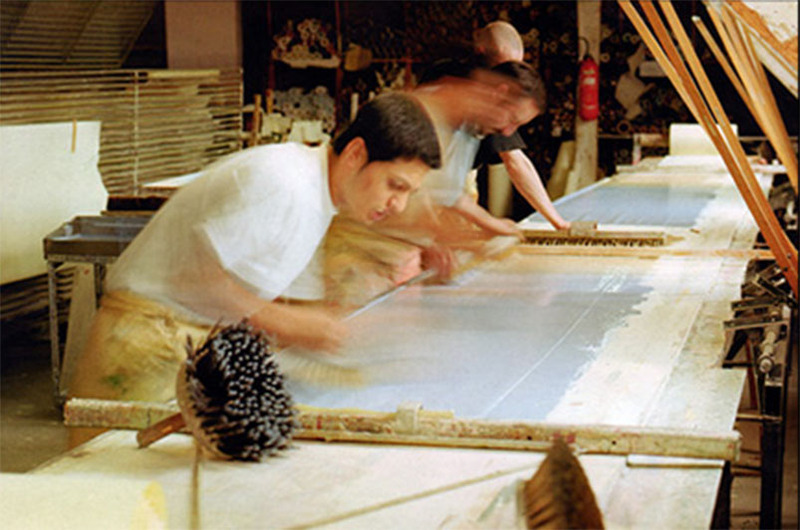 The Zuber factory still uses today the traditional hand-printing techniques in use since the establishment of the company (90% of the production in 2012) and especially woodblock-printing on hand-brushed background (150,000 antique woodblocks, listed “Monuments Historiques”). Among them, we can mention: trough stripe printing, colour gradient printing, embossing or gaufrage, “velour” papers printing. The rest of the production is carried out using a technique developed by the creative team of the company, mixing hand-printing and mechanical type printing as well as water base and solvent base products. Hand-brushing of the background, silk screen printing or inkjet printing, screen gilding, finishes, ageing, hand-made patina, velveting, embossing. This combination of techniques is particularly complex and the cost price is high. As a result its use is restricted to special productions in limited quantity, requiring many colours or a complex layout.